Jimmy Johnstone, Sir Alex Ferguson, Eusébio et al. 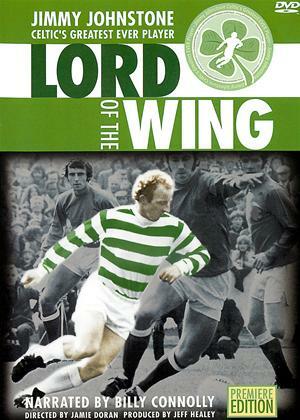 "Lord of the Wing" - the true story of the greatest entertainer the world of football has Ever seen. From the 'Jungle' at Parkhead to the sun-kissed terraces of Lisbon, Jimmy Johnstone was a God with a leather football at his feet; mesmerising twists and turns leaving the game's greatest defenders close to tears... and Celtic fans laughing in wonderment. For millions of Celtic supporters and genuine football fanatics, the lasting memory of Jimmy Johnstone is of his incredible skills as he destroyed Red Star Belgrade, Real Madrid, Rangers and many, many more. True geniuses inevitably follow a chequered path off-the-field and Jinky was no exception: alcoholism came close to destroying his career and, almost, his life. This frank and honest biographical film includes outstanding footage from the many highlights of his footballing days along with tributes from, amongst others: Sir Alex Ferguson, Eusebio, Johann Cruyff, Sir Bobby Charlton, Denis Law, Billy McNeil MBE, the Lisbon Lions, Paddy Crerand, Terry Cooper, Henrik Larsson, Martin O'Neill OBE, John Robertson, Gordon Strachan and, in an astonishingly rare interview, Alfredo Di Stefano, of Real Madrid. Not to forget that other world of entertainment, as stars including actor Robert Duvall, Frankie Miller and Fran Healy (Travis) line up to honour 'the wee man.' The film culminates as Jimmy joins (Simple Minds) Jim Kerr and Charlie Burchill in a recording studio to give an incredible performance of Ewan MacColl's classic 'Dirty Old Town'. Enigmatic, immense, astonishing; no hyperbole can properly describe an individual whose like we will never see again.